Moving Supplies – Bronte Movers & Storage – Local Movers in Burlington, Oakville, Milton, Mississauga. We move people all over Ontario & Long Distance. Household moving, corporate moving, packing services, storage facilities, moving supplies, move management. Home of the piano moving experts. REACH YOUR DESTINATION 100% SURE AND SAFE, On Time, Secure, Reliable, Honest and Efficient. THE COMPLETE SOLUTION FOR ALL YOUR MOVING NEEDS! 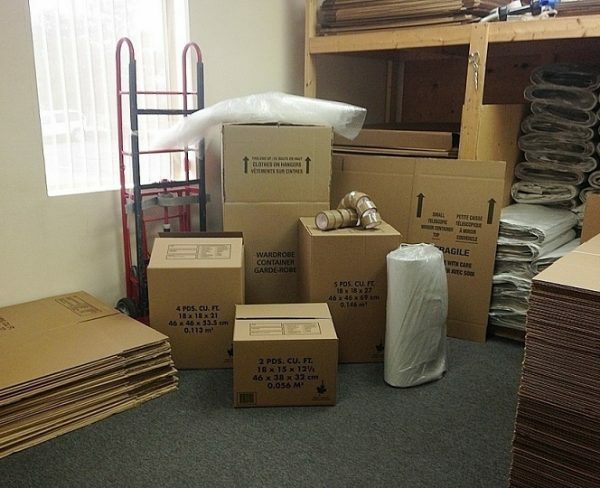 Rental Program: Any size box for $3.00 – $1.00 return – no damages to box or writing on the box. Write on the tape with a permanent marker. The large picture box if needed has an extender for larger pictures and mirrors. It slides into the large box. TV boxes available upon request the price of the box is determined on size required. Bubble wrap – plastic packing material has hundreds of air cushions used to double-wrap small, delicate items already wrapped in tissue; larger fragile items such as lamps and pictures. Packing paper – wrap everyday items to prevent scratching; crunched up it can be used as cushioning. For fragile delicate figurines and china. Packing tape – plastic tape, always test first to ensure it does not ruin finishes before taping up drawers and canisters. 2 cube – used for small heavy objects like books, records, cans, jars of food, utensils, flatware, shoes, etc. 4 cube – used for lamps, lampshades, tupperware, small kitchen appliances, blenders, juicers, etc..
5 cube – used for pillows, cushions, blankets, comforters – no heavy items. If the box is to heavy for you it is to heavy for our movers. Wardrobe – transport clothes directly from hangers to the metal bar that supports the clothes inside the box. Picture/mirror – small, large or x-large; can be customized by telescoping the extender in and out; use crumpled packing paper in corners for cushioning and wrap your mirror or picture with bubble wrap before placing it in the box for additional support.